It was a sword that dominated the battlefield across different regions in Europe, it was a sword a thousand years ahead of its time, built by mysterious craftsmen. Even though it was used by many nations it is a sword that was attributed to the Vikings and used from about 800 to 1100 AD, it was a masterpiece built from pure steel and that wasn’t seen again in Europe for at least a thousand years. It was the ultimate sword of its time and it was used by only a few select warriors. Why these swords have the inscription of Ulfberht is still a mystery as it does not appear in written texts from that time, it could have been the name of the place it was produced, or it could have been added to to sword to provide proof of authenticity. 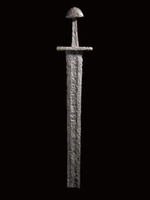 So far, a dozen of forty-four examined Ulfberht swords are proven to be made entirely of crucible steel, though some of the forgeries are of pretty good quality. The fact that Ulfberht swords appear for over two hundred years, proves that they were not produced by a single craftsmen. Dating showed that the swords were produced from 850 – 1100 AD which makes researchers believe that Ulfberht was in fact one of the most ancient trademarks, a sign of quality. In Ancient Times Iron Smith’s goal was steel that could strike a hard object and neither bend nor shatter, steel that could hold a sharp edge. Thousands of Ulfberht swords were found across Europe, most of them found in rivers or or excavated from Viking burials across Europe and Scandinavia but only around 170 Swords are proven to be the real Ulfberht swords. These ancient masterpieces of weaponry have been buried for centuries and are only corroded skeletons of what they where once. Smelted Iron was normally used to forge weapons and armor for thousands of years, Iron on its own it too soft to yield a strong weapon that why sword-makers would add carbon from coal or charcoal which hardens the metal and turns it into steal. Typical Viking age swords had low carbon in their characteristics and had a large amount of impurities or slag, a non metallic part of the ore which was not separated and which weakens the metal. Blacksmiths across Europe were not able to create Slag-free-steel because their fires were simply not hot enough to full liquefy the iron. Today we achieve that by heating the metal to over three thousand degrees which accurately removes slag and allows more carbon to be added. Research showed incredible similarities between the steel of the Ulfberht and modern day objects made from steel with a carbon content of up to three times more that the average medieval steel. This places the Ulfberht sword at least a thousand years ahead of its time. The metal used in the Ulfberht swords is today known as crucible steel; a term that applies to steel made by two different methods in the modern era. It is made by melting iron and other materials in a crucible and pouring the molten metal into a mould. Crucible steel was produced in South and Central Asia during the medieval era. .
Another example that Vikings were not only great warriors but equally skilled sword smiths, ship builders, navigators, craftsmen, traders and explorers. A great video, watched it several times. Remember the days when YouTube was just a place where idiots could show the world what idiots they are but they now have some great videos on it. I use it a lot. As a historian, the ironic part about history is that our so called "primitive" forebears have consistently proven that they were much more sophisticated then we gave them credit for. Crucible steel was supposedly a 18th Century European invention. Until they found these swords. And then realized that someone in India had figured this out seven hundred years before Europe did. Same thing with the use of copper in the Neolitic period. The discovery of Atzi in the Alps literally punched reset on the use of metal by humanity. I find it interesting that most documentaries about the Vikings are made by the British and they also have a large number of Viking reenactment groups there. When you consider the fact that they were the prime target for Viking raids, that would be like Native Americans celebrating the arrival of the white man to North America. Guess it just shows how fascinating the Vikings were. If you want to read a really good historical fiction series of vikings in England check out The Saxon Stories by Bernard Cornwell (starts with "The Last Kingdom"). He writes about 9th century Britain and the struggle between the Saxon Kingdoms and the Danes, Norse, and Swedes who very nearly conquered all of England. I enjoyed Agincourt and the Archer's Tale too. (1356 is a great sequel to the Archer's Tale and revolves around the battle of Poitiers). I have mainly read his medieval period books, but I haven't read the Sharpe series. I have a budding interest in the Napoleonic era so I'll check out the books along with the movies. Thanks for the suggestion. It will be a unique experience to see Sean Bean survive a movie. Maybe a 1,000 year delayed case of "Stockholm syndrome"...? Those who beat their weapons into plows, will plow for those who don't. One detail strikes me as a bit odd; how do they determine that only 170 of the swords (out of thousands) are "real" ULFBERHT swords while the rest are forgeries? I am curious about what the basis for this determination is. Simply the steel content? I would venture that not every sword made under that name was made of crucible steel. Maybe I'm a bit subjective about this issue, but so are the people of media who spread this info around. I just see it as a continuation of a well known theory that anything medieval european is crap and medieval asian is super cool and best ever, so viking swords must have been crap unless they are made of misterious Asian super steel. No, your not been too subjective. There has been a fairly long established academic trend in both history and literature that is strongly anti-western. Its pretty politically driven, so I wont touch on that, but the summation is that since academic circles require a "publish or perish" mentality, its very easy to take a deconstructionist view of someones previous works on the subject and attempt to discredit their premise and findings. Of course, the ironic part is that the "new" history folks are often just as wrong. The whole theory on the Maya blew up in their faces over the last 20 years, for example. The flip side is that newer, more scientifically driven analysis of previous findings is playing hell with a lot of academic assumptions of history. Otzi the Iceman, for example, completely turned the entire timeline of the late neolithic on is collective ear. Unfortunately, history, like news reporting, is subject to a great deal of "interpretation" right now. As always man is never as smart as he thinks he is. We keep proving that over and over again. It also cracks me up how we think that without modern technology everything back then was crude. I would like to know how the Romans built bridges that are still being used today and survived two world wars and now we can't build anything that can last more then fifty years. Because they say "Ulfbehrt". 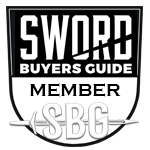 It isn't that 170 out of thousands are "real" Ulfberht swords while the rest are forgeries, it that 170 out of thousands are Ulfberht swords, while the rest aren't Ulfberht swords. The "thousands" is just the total number of "Viking" swords (including non-Viking finds of them). That 170 Ulfberht swords includes all the different spellings, the probably-crucible-steel ones, the pattern-welded ones, all of them. About 50 of the 170 are the "real" Ulfberhts (+VLFBERH+T), and are mostly crucible steel. Why "real"? It isn't just the steel, but some of the others are mis-spelled (missing letters, upside-down letters, etc.). One of the journalistic quotes notes that the "fakes" might have shattered like glass: "It must have been an appalling moment when a Viking realised he had paid two cows for a fake designer sword; a clash of blade on blade in battle would have led to his sword, still sharp enough to slice through bone, shattering like glass." The funny thing is that it's the crucible steel ones that would have broken like glass, not the "fakes". Some of the non-crucible-steel ones have the inscription spelled consistently, and since we don't know what "ulfberht" really means, we don't know which spelling is correct, or even if there is a "correct" spelling. I agree. I would bet that a lot of the bias about the technology is owed at least in part to the fact that much of Europe was illiterate during the Dark Ages. The point to be had is that illiterate is not the same thing as unintelligent. Yes, the +VLFBERHT+ swords look older than the +VLFBERH+T. 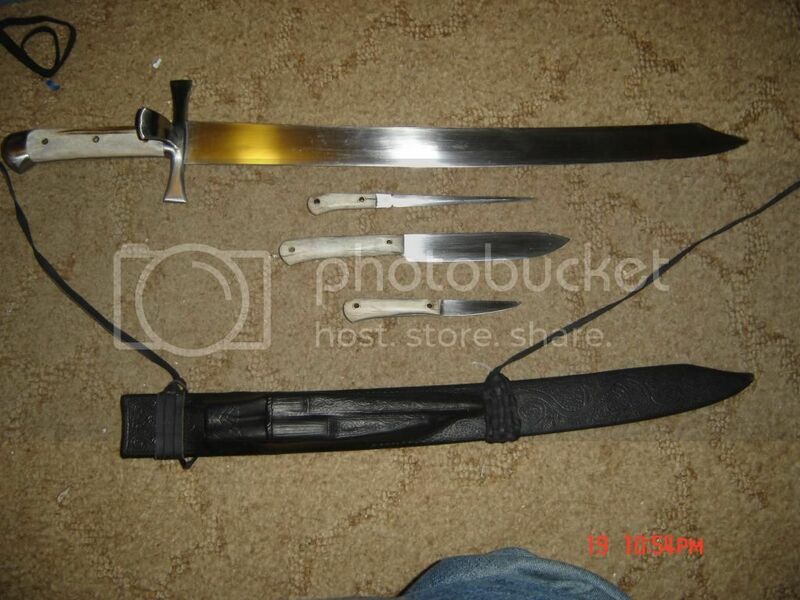 They're also usually well-made pattern-welded swords with hardened high-carbon steel edges. Considering the variation in working and heat-treatment of the crucible steel +VLFBERH+T swords, they're perhaps the better-made and better-quality ones. The various miscellaneous spelling Ulfberhts - including the low-carbon steel ones and iron ones - might be fakes. The +VLFBERHT+ swords have harder edges (typically about 450VPH) than the +VLFBERH+T swords (typically about 300VPH) - the +VLFBERHT+ swords are quench-hardened and the +VLFBERH+T swords aren't quenched (because they're crucible steel and will be too brittle if quenched).